When I found out my work owed me £130, the first thing that entered my head was the New Look Summer Sale I saw online the other day. What better way to spend extra cash than on HUGE clothing savings, am I right? I’m going to run through what I bought and how much I saved, because I quite enjoy reading these kinds of blogs myself. It feeds my frugalness. I’ve been wanting a pair of boots like these for ages, but just didn’t get round to buying a pair. I’ve actually only realised they’re real leather AFTER buying them, and I would never usually buy any leather products – I really should read the description of items before buying them. SO I am a little gutted by the material. I honestly thought they looked pleather anyway so it mustn’t be a very good leather, ha! Anyway, the style is very nice. The heel is a little big for me to wear regularly but I think with a pair of jeans and a cute tee, they will look perfect. I’m quite a basic person. And basic people like me, like to get plain t-shirts with a tiny little detail like a choker because, it’s cute.. and this t-shirt is cute. It would look great under a leather or khaki jacket and with either leggings or jeans. It would actually look pretty good with those black boots too. It’s 100% cotton and feels super soft, and it’s a floating material. It’s rather nice for the British summer weather. It has a v-neck front and is oversized so great for being a little airy but without being revealing. I’m a little late jumping on the band wagon here and I’m fully aware tie dye was popular last year. I’ve actually never owned anything tie dye, and I liked how this t-shirt isn’t too “in your face”. It’s a mix of white and red-purple, and I think it looked the right amount of plain with a hint of colour. It has a rounded neckline and rolled up sleeves, which I think would look great with a pair of jeans and some heels, or even tucked into a skirt. I love having my shoulders out, I feel like it makes me look slimmer. And I like to show off the tattoos on my right arm so, any opportunity to wear clothes that look nice but show it off, I take it. I love how gentle this t-shirt looks with the very soft lilac colour and how casual it looked on the model. I think paired with some leggings and either boots or sandals, it will look ace. Now as I said before, I am pretty damn basic. I literally only wear plain jeans or leggings. I wanted to go out of my comfort zone and buy something a little different. These khaki trousers seemed the way to go. They’re not too “out there” but can be dressed up or down easily with some heels or some flat boots. I like that the material is cotton, lyocell and elastane; so, they’re both comfortable and fairly stretchy – wear them to a buffet, yas! I wanted to push a little further out my comfort zone. These lilac jeans looked SO cute on the model, and they may not look great on me but I kinda love them. Purple is my favourite colour and this lilac is so soft and subtle. They’re also made from cotton, lyocell and elastane. With a pair of black boots and maybe that white choker tee… could make a sweet outfit. Like I said, I love me some shoulder showing off... another cold shoulder top! It’s viscose and polyester so not as soft as cotton but it’s still a comfortable wear. The description on the website say’s it’s pink; but it’s a brown/red/purple. I don’t see pink at all, but I still really like the colour. It’s quite large fitting, which is also something I tend to go for, so win-win. This is something else I’ve been wanting for a long time but just didn’t get round to it for some reason. I absolutely love how mustard looks on other people and models; I was never brave enough to try it myself since I’m super pale. What better time to try new things than when they’re half price! It’s a really large knitted, ribbed jumper with a v-neck, AND cold shoulders – it’s everything I love in a jumper. It is quite rough to wear and it already arrived with a click in the knitting but I can look past that, I’ll still wear it nonetheless. I’ve been needing a decent pair of sandals for the summer and for my holiday to Ibiza in August, but I’m very particular when it comes to shoes that I’ll wear for several days in a row. I have Plantar Fasciitis, so it’s hard for me to find the right sandals, because I can’t hide my special insoles inside them like I can with other shoes and boots. I needed some that aren’t too low heel, or too high. The heel on these are perfect and I love the little gold detail. The suedette (imitation suede) is soft and the colour will match most clothing for the summer, so I’ll definitely get a lot of use out of these! Now I’m obsessed with all things coconut oil – I use it ALL the time. When I saw this oil was only £2 it was a “why not” moment. The oil smells AMAZING, and it really does soak in fast. I used it on my arms and got dressed straight away. There was no left-over residue and my skin felt silky soft. I’m very impressed New Look – well done! I don’t have a decent photo of this item so I took the photo from New Looks website. I am so gutted that my phone case arrived broken with a crack because it’s probably the favourite item I bought. 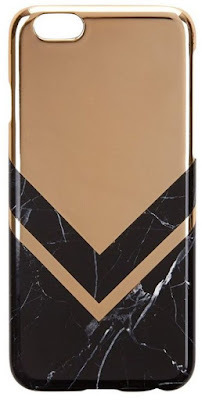 It’s a gorgeous gold metallic case with black marble detail. It looked stunning. New Look have of course refunded me for this and it’s so sad that the item is now out of stock, so I’ll have to live with my Bambi phone case for a little longer. Had this not arrived broken, I would have been happy as Larry – it’s lush! In total I spent £83.00, which is an absolute bargain for how much I got. I saved an awful lot of money, and got some pretty awesome new clothes to try out, and I know for a fact I’ll wear most of them a lot. I’ll be uploading outfit photos as and when I wear them, so do check out my Instagram and follow me to be able to see those!